The big news in the Apple portable orbit this week was the rollout of upgraded PowerBooks and iBooks. I won't belabor news that you've no doubt read elsewhere by now, but here's a brief recap of the highlights. The new PowerBook G4 line features G4 processors of 550 and 667 MHz with 256K of on-chip level 2 cache running at full processor speed, a 133 MHz system bus on the 667 MHz variant, a new ATI Mobility Radeon AGP 4x graphics card with 16 MB of DDR video memory, built-in gigabit ethernet, larger hard drives (up to 48 GB), and an optional CD-RW slot-loading optical drive ($100 extra), as well as a very nice new AC power adapter to replace the unloved yo-yo style unit. The $99 AirPort card is now preinstalled on 667 MHz model. For a limited time, the Titanium PowerBook G4s will ship from The Apple Store with double the amount of RAM (i.e. : 256 MB and 512 MB) at no additional cost. Other vendors may offer similar deals. The upgraded iBook offers 600 MHz PowerPC G3 processors on the higher-end units, a new system bus running up to 100 MHz on the 600 MHz machines, larger hard drives (up to 20 GB), and 128 MB of RAM standard across the board. iBook buyers can choose the 600 MHz model with DVD, CD-RW, or a DVD-ROM/CD-RW "Combo" drive for both burning CDs and watching movies on DVDs. The $1,299 base model continues with a CD-ROM drive, 500 MHz processor, and 66 MHz system bus. 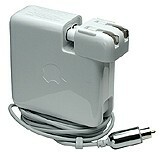 The iBook gets the new, small, lightweight power adapter as well. The value-added new features are solid improvements, and the fact that the top-end model come with a significant price reduction is icing on the cake. This will add more downward pressure to used PowerBook and iBook prices, with the first generation TiBooks now selling used, refurbished, and even new for under $2,000. Wish your 2001 iBook had a handle like the old iBook? Cyber3 comes to the rescue with the iBook Tote and Tilt. Wish your titanium PowerBook G4 had a handle like the iBook used to? Cyber3 comes through with an updated TiBook Tote and Tilt. The display now opens to approx. 135 degrees and it better matches the Titanium PowerBook's color. Tote your PowerBook by a handle. 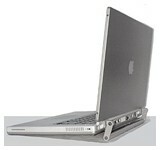 Tilt to allow air circulation under your PowerBook, helps to increase battery life and performance. Easy access to rear data ports. All aluminum construction for lightness & sturdiness. Color powder coated to match the PowerBook. 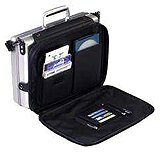 The Dr. Bott TiCasePlus for the PowerBook G4 has a side bag for additional storage for peripherals and paperwork and a comfortable shoulder strap. No less than James Bond uses the case in "The World Is Not Enough" to pave his way out of a sticky situation. The worldwide success of TiCase provided Dr. Bott with highly valued feedback from enthusiastic users. With these hints and ideas we set out to extend usability and flexibility of the original model. Usable space was to be increased without compromising the sleek shape and the outstanding protectiveness. A shoulder strap was requested for added carrying comfort, particularly when walking for longer distances. The design needs to be variable enough to offer the original low-bulk solution, too. Existing TiCases must be upgradeable. After all, it was our existing customers who gave us vital input for TiCasePlus! The insides, complete with LiftoMatic, which allows for comfortable use of the TiBook right inside TiCase, are standard in TiCasePlus as well. TiCasePlus was extended by a removable black side bag. The side bag offers three inside pockets, pen holders and an external zippered pocket. The inside pockets offer enough space to hold an external drive and several CDs. The VST ultra portable CD-RW FireWire drive fits very nicely into the largest of the inside pockets. The side bag is fastened on the TiCase body with four buttons and is removed in a snap. This leaves you with light gear: the original TiCase and a shoulder strap. The side bag is also a useful standalone - just Velcro the buttons to the sides and use it as a light briefcase whenever you leave your TiBook at home! The new shoulder strap is ergonomically formed, very wide and soft and has a special anti-slip surface. As it is fastened to the lid you will find that weight is evenly distributed even when the side bag is loaded. Sleek, ultra-protective case in cool brushed-aluminum look. Protects the ultra thin TiBook display from accidental bumps and flexing common to bags and skins! Get to work on the TiBook right inside the case - no messing with straps! Room for power supply, power cord, spare battery and miscellanea. Detachable side bag with room for documents, CDs, drives and more! No larger than a personal CD player, the Archos MiniCDRW 8x4x24 is a CD-Recordable and CD-Rewritable device for reading, duplicating, and compiling CD media. The MiniCDRW product line provides the perfect solution to store data, music, video or other large capacity files both at home or on the road. The first CD-RW device no larger than portable CD-Player weighs just over 18 oz. and provides you with recording capability of up to 3 CD-R or CD-RW in one hour! You can connect to virtually any Mac notebook or desktop with a FireWire interface cable. The MiniCDRW is hot swappable, with plug and play convenience. Delivered with mastering software - Toast for the Mac, the MiniCDRW allows you to write, update and rewrite your files thousands of times. The "Drag and Drop" feature facilitates the task - just like saving data on a hard disk. 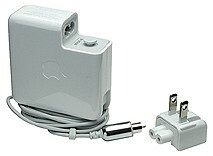 Package Includes MiniCDRW with FireWire interface cable and AC adapter. Includes CD mastering software for creating audio and data compact discs. Similar to the FireWire product, the Archos MiniCDRW with USB interface rivals the reading speed of many CD-ROM drives on the market by reading at up to 24x, writing up to 8x, and rewriting at up to 4x. This provides you with recording capability of up to 3 CD-R or CD-RW in one hour. You can connect to virtually any Mac notebook or desktop with a USB interface cable. Package Includes MiniCDRW with USB interface cable and AC adapter. Includes CD mastering software for creating audio and data compact discs. 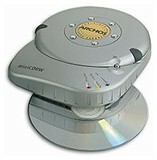 The Archos MiniCDRW 4x4x24 is a CD-Recordable and CD-Rewritable device for reading, duplicating, and compiling CD media. MiniCDRW reads at up to 24x, writes up to 4x, and rewrites at up to 4x, providing you with recording capability of up to 2 CD-R or CD-RW in one hour. Package Includes MiniCDRW with USB cable and AC adapter. Includes CD mastering software for creating audio and data compact discs. As noted in the item above about the new 'Books, Apple has done away with the yo-yo power adapter and replaced it with a slick and innovative new unit shipping with the newest 'Books. It will be available separately next month at a projected price of $70. The new power adapter comes with an AC cord used for plugging it into the wall. This configuration allows the adapter to stretch 12 feet (4 m) from wall to computer. The power adapter may also come with an AC-plug (not available in all regions). The AC-plug, used in place of the AC cord, allows the adapter to plug directly into the wall outlet. This configuration allows for maximum portability. The DC-cable, which plugs into your computer, has an embedded status ring that glows amber when your battery is charging and green when your it is fully charged. When not in use, the DC-cord may be wound around two retractable gull-wings, which fold from two of the adapter's corners. Green glow: Power is only being used to operate the computer. Amber glow: If the computer is on, power is being used to operate the computer and any remaining power is used to charge the battery. If the computer is shut down or in sleep, the majority of power is directed toward charging the main battery. Note: Make sure the adapter's DC connector is fully inserted into the computer's power adapter port. The adapter's green indicator will come on before the connector is fully inserted into the computer. For more information, read <https://web.archive.org/web/20020611200820/http://docs.info.apple.com/article.html?artnum=88231>.